The High Optical Resolution Spectrograph (HORuS) is a high-resolution spectrograph on GTC. HORuS has a FWHM resolving power of about 25,000. It collects light at the Nasmyth focal plane, shared with OSIRIS, using a 3x3 IFU (2.3x2.3 arcsec) with microlenses, into optical fibers that form a pseudo-slit at the spectrograph entrance, providing almost continuous coverage between 380 and 690 nm. As HORuS is a Visitor Instrument, this web page gives only a minimal amount of information. Users are recommended to visit the HORuS website for details. HORuS is a high-resolution spectrograph on GTC based on components from UES, a spectrograph which was in use at the 4.2-m William Herschel Telescope (WHT) between 1992 and 2001. 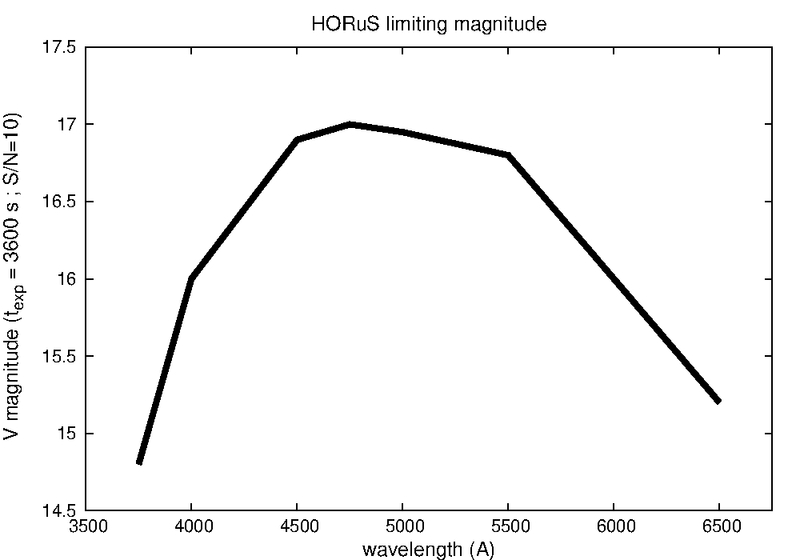 HORuS is relatively simple and provides GTC with the ability to obtain moderately high resolution spectra (R=25000) with broad spectral coverage for point sources. HORuS collects light at the Nasmyth focal plane, shared with OSIRIS, using a 3x3 IFU (2.3x2.3 arcsec) into optical fibers that form a pseudo-slit at the spectrograph entrance. The light is dispersed with a 79 gr/mm echelle grating and cross-dispersed with three prisms, providing almost continuous coverage between 380 and 690 nm. 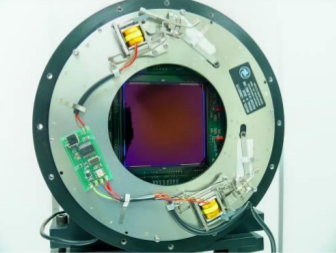 The introduction of a folding mirror greatly reduces the footprint of the instrument, and a bundle of fibers (together with an array of microlenses) makes it possible to cover the seeing disc (<20% loss of light from point sources for a seeing FWHM ~1.5 arcsec). 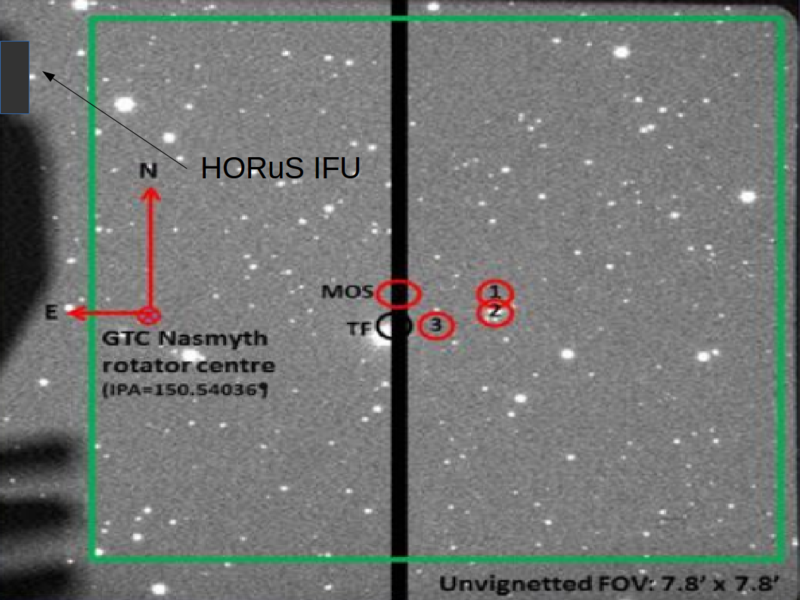 HORuS will operate on the GTC as a general-purpose high-resolution spectrograph. HORuS is a Visitor Instrument on GTC, and its commissioning was completed in December 2017. HORuS IFU configuration at the GTC focal plane (left) and pseudoslit for calibrations purposes (right). HORuS signal-to-noise ratio per pixel for a 15 min. exposure on HD 140283. 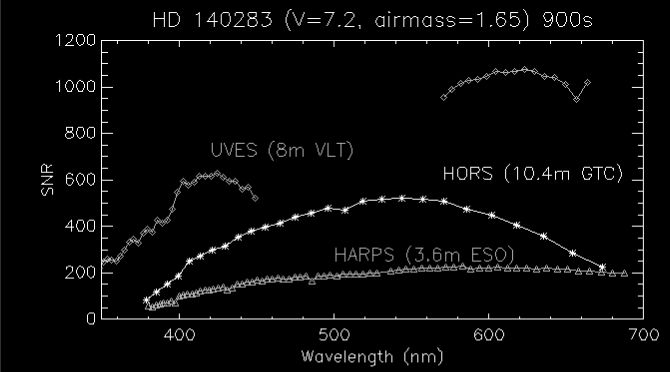 For comparison, the gray curves show the predictions for UVES (1 arcsecond slit, 1 arcsecond seeing on the 8m VLT), and HARPS (fiber-fed on a 3.6m telescope). 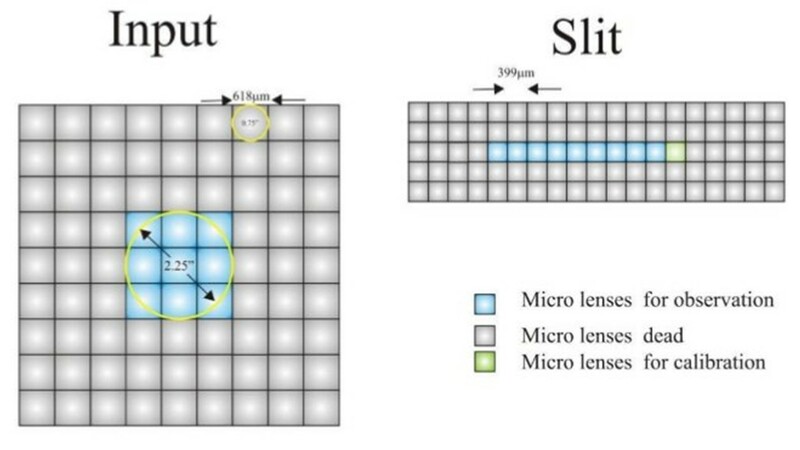 An array of microlenses is used to modify the focal ratio of the telescope (f/17) to a suitable value for optical fibers (f/2.5). In the pseudo-slit of the spectrograph, a second array of microlenses adapts the focal output ratio to that of the instrument's collimator (f/11). The new instrument is at the GTC Nasmyth-B focus where OSIRIS is currently located, sharing focus with it but without interfering in any way with its usual operation. The optical design of HORuS involves only one main modification of UES, the introduction of a flat mirror (folder) after the collimator in order to produce a more compact design. Top: Ray-trace through the HORuS optics. Bottom: View of the light path of HORuS without the protection cover. Top panel: View of the entrance of the optical fiber in OSIRIS (through the main connection panel) and the two cables of the calibration mechanism (motor and zero switch). Bottom panel: View of the supporting structure for the cable that communicates OSIRIS with the HORuS spectrograph. The CCD camera is a "plug and play" system, supplied by the company Spectral Instruments (SI). It consists of a main module, or "camera head" which contains both the CCD itself (in this case, a model Fairchild CCD486 BI of 4096 x 4096 pixels), proximity electronics, and a coupled shutter. In the case of HORuS this shutter is located immediately after the pseudo-slit. Left panel: Camera head module with the original shutter open, showing the Fairchild CCD486 as mounted by Spectral Instruments. This shutter has been replaced with a much smaller one located immediately after the pseudo-slit in HORuS. Right panel: Rear view and connection of the CCD camera. 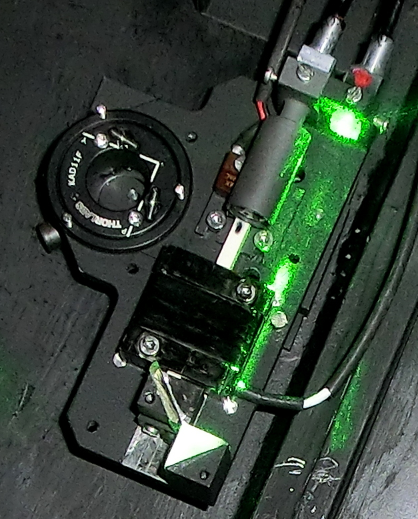 The acquisition arm consists of a mechanical frame, two optical fiber links (one feeding light from the calibration lamps and the one that goes to the spectrograph) and an electric motor that introduces this element in the optical path to feed light from the calibration lamps into the science fibers. 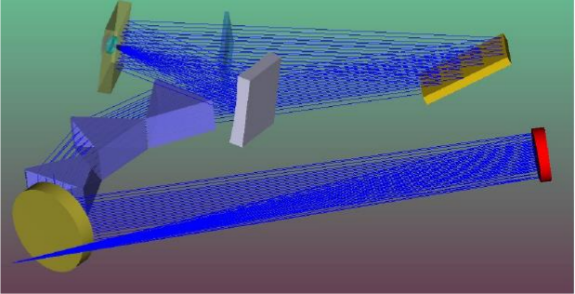 The movement of the mirror between the "SKY" and "CALIBRATION" positions is carried out by a PI-NI 310 NEXACT piezoelectric actuator (Miniature Linear Actuator), with nominal travel length of 10mm (something more in practice, ~ 12mm). It is managed via serial port USB for a PI driver model E-861 (NEXACT Controller) in open loop. Left: assembly of the acquisition arm within the OSIRIS focal plane. Right: OSIRIS focal plane in Nasmyth-B, showing its useful field of view and the shadow introduced by the folder vignetting and three of the filter wheels. The HORuS arm is placed in the vignetted area of the OSIRIS folder including the optical fibers and the array of microlenses. The HORuS Control Software runs on a Windows XP PC. This is due to the incompatibility of the drivers of the CCD camera with more recent operating systems. The PC is located in Cabinet A, near the spectrograph. The connection to the PC is made through Ethernet using a virtual windows remote desktop. 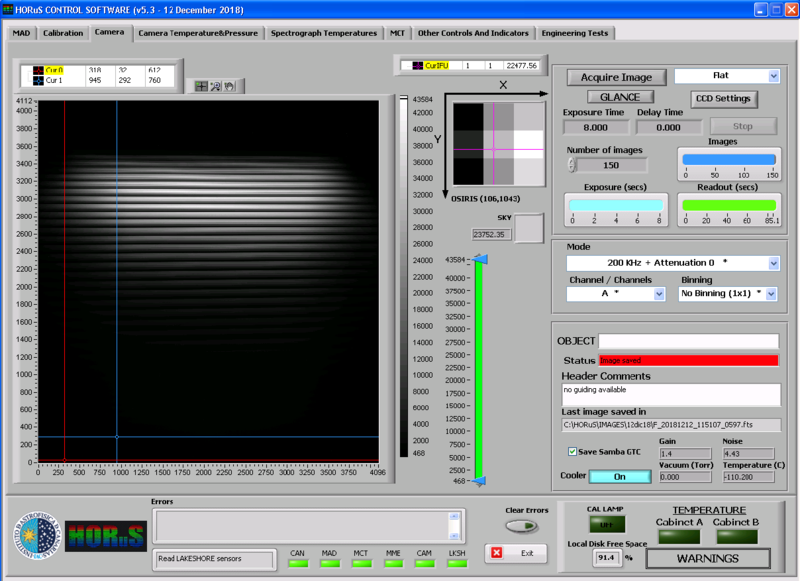 A screenshot of the windows-based HORuS interface, used by astronomers at the telescope to control the instrument. There also exists an engineering interface for low-level control and telemetry of the CCD controller. The HORS control software is very easy to use. The user interface shows different labels associated with the different functions performed by the software. These tabs are only enabled when the corresponding function can be performed. For example, the Camera label will only be available when its electronics are on. Note that the "Camera Temperature & Pressure" and "Spectrograph Temperatures" tabs are always displayed (same as the MCT enabled from the beginning of the program), even when the associated equipment is not turned on. This is so that in case of switching off these devices, you can continue seeing the previous values. One can then acquire images from the CCD camera according to different parameters that can be selected by the user. The data reduction pipeline for HORuS, the HORuS chain, is available. A preliminary version can be obtained from C. Allende Prieto (callende[at]iac.es) under request.. The target acquisition for HORuS is based on acquiring the object with OSIRIS in the first instance. It is necessary to center the object to be observed (and the axis of rotation) near the pixel (250,1046) on the OSIRIS CCD1 (depending on the pointing error and the precision of the coordinates supplied by the user). In order to center the target at the pixel (250,1046) of the CCD1 an acquisition image, taking with OSIRIS, is required. The parameters to define the acquisition are the filter to be used and the Integration exposure time in seconds. As a guideline, here is a table for the exposure times needed for acquiring in OSIRIS using the g-band filter and assuming 1 arcsec seeing, gray night and airmass = 1.5. Note that stars brigther than g'=10 saturate even at the shortest exposure times, but that is not a problem for acquiring the object. Once the object has been centered at the pixel (250,1046), an offset is applied to center the object in the HORUs IFU. That position corresponds to the pixel (106,1043) on OSIRIS CCD1, using binning 2x2. Note that the position of the fiber bundle is within the vignetted area of OSIRIS in the CCD1. 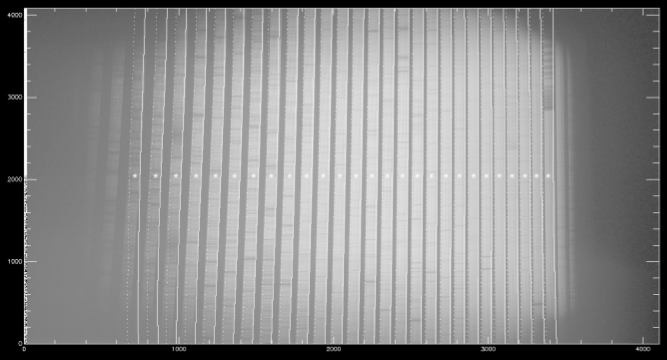 Once in the HORuS field you have to make an acquisition image with the instrument (GLANCE in HORus panel). You can reach mag 17 in about 60 seconds if the sky is clear and seeing below 1 arcsec. Once centered, we will be in a position to make the scientific observation. Regarding the calibrations, the fiber destined to the sky (SKY) is displaced about 2.1 arsec with respect to the center of the IFU of HORuS. It should be verified that the illumination of that fiber is the minimum for an optimal correction. The calibrations of arcs and spectral flats can be made at any time later, or earlier, to the observations. In the case of observations that require high precision in the calibration of the lines, calibration arcs could be obtained just before and after the observations of the object without any cost for the observation program. In the next plots it is shown the instrumental response in spectroscopic mode, measured using spectrophotometric standard stars of type A/B through the HORuS IFU, as a function of wavelength and for different magnitudes. The upper plot shows the signal-to-noise per resolution element (represented in logarithmic scale) vs magnitude attained in 1h of integration time for stars of magnitude V = 10, 12, 14, 16 and 17 respectively, based on the HORuS ETC. Also, the limiting magnitudes attainable with HORuS in 1 h of integration time to get S/N=10 per resolution element are shown in the lower plot. Note that the S/N is a strong function of wavelength, dominated by the blaze function for each spectral order. 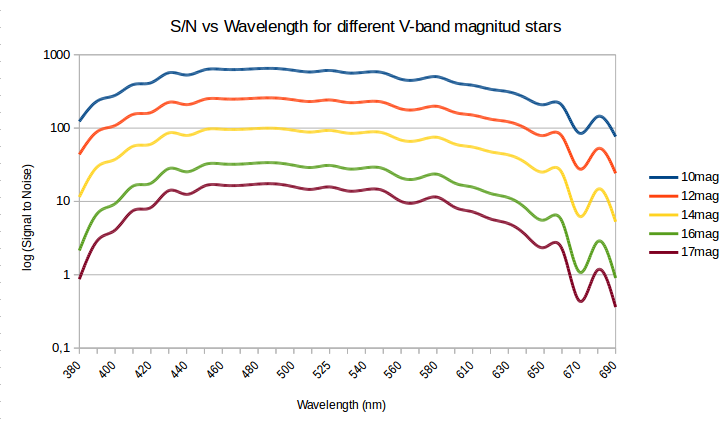 A more detailed map of the S/N with wavelength can be obtained using the HORuS ETC. Signal-to-noise per resolution element (represented in logarithmic scale) vs magnitude in 1h of integration time for stars of magnitude V = 10, 12, 14, 16 and 17 respectively, based on the HORuS ETC. Limiting magnitudes for obtaining S/N=10 per resolution element in 1 h of integration time with HORuS, based on the HORuS ETC. 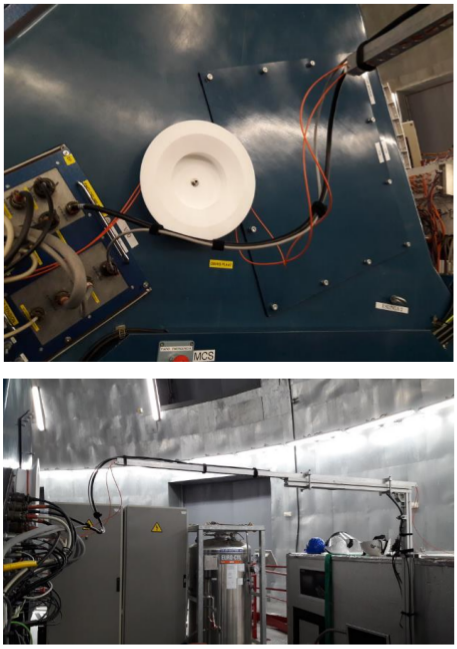 The completed HORuS instrument was installed and tested on the sky at end of June 2018. 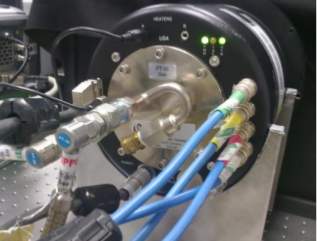 The instrument was used for the first time in conjunction with the final fiber link, which had been previously demonstrated to provide about 80% of transmission in laboratory tests. 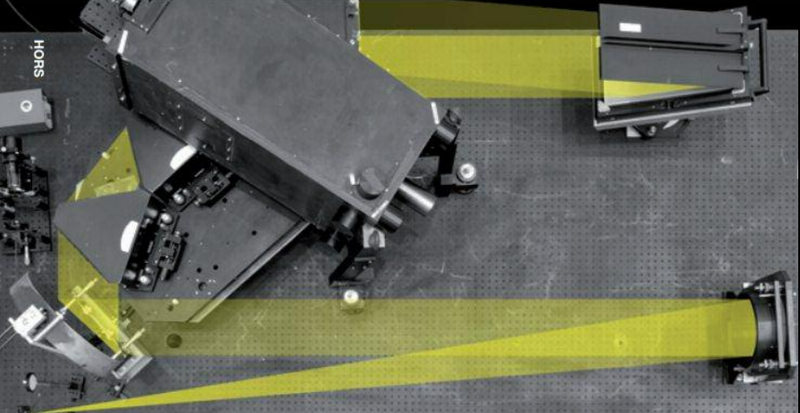 The acquisition arm, which was linked to some of the performance issues found two years earlier, had also been replaced with a new one, designed from scratch to provide more rigidity and stability, and which had been checked at the IAC to return to the same SKY/CAL positions within specifications. The acquisition software had also been upgraded in many regards, including calibration sequences, the ability to compute 3x3 images for the IFU, and thorough checks at every step of the operations. The data secured in June reveals that the HORuS image quality is appropriate, with a constant level bias level in the detector (around 500 counts in the 'slow' readout mode), very little background light, and modest scattered light within the instrument. 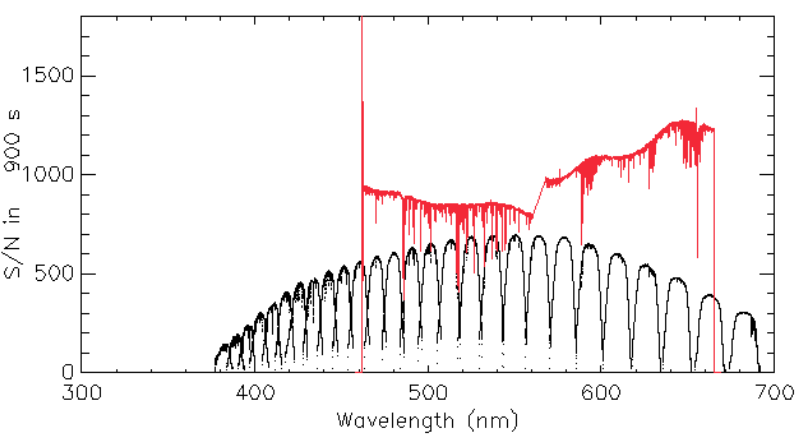 This can be appreciated in the figure below, where the spectra of the blue sky and a bias exposure, are shown. The fiber-to-fiber throughput variationsamount to only a few percent, as expected from data taken at the IAC. 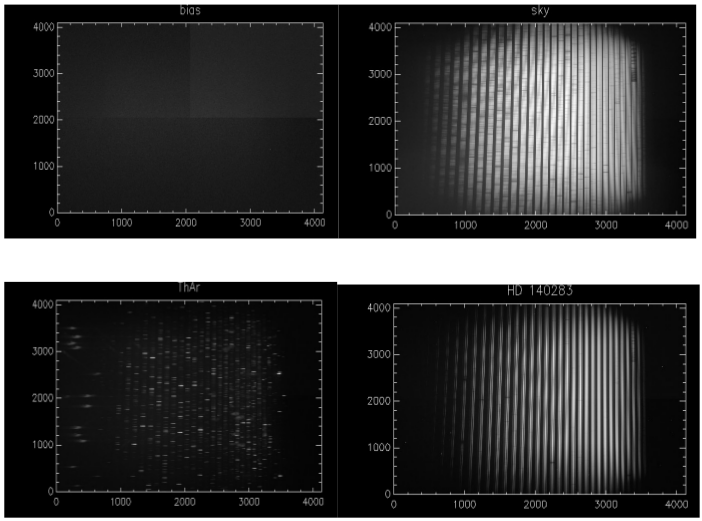 Images showing a bias (top left-hand panel), a spectrum of the blue sky at twilight (top right- hand panel), a ThAr spectrum (bottom-left) and a spectrum of the metal-poor star HD 140283 (V=7.2). The detector was read using 4 channels, which leaves a distinct signature (at the level of a few electrons) among the quadrants, as can be seen in the bias frame. The spectral coverage was confirmed from the sky spectrum. Some 27 orders were measured, from order 59 in the blue end, spanning approximately 379.9- 386.4 nm, to order 33 in the red end, spanning 674.5-695.3 nm. The dispersion direction is aligned quite well with the detector, especially in the red. We nevertheless trace the distortion with polynomials to extract the spectra, as illustrated in the figure below. The orders have a fairly constant half-width across the cross-dispersion direction, about 33.8 pixels (with no binning on the CCD). Spectrum of the sky where the tracing or the orders has been overlaid: in dash for the left-side and solid for the right side of each order. Emission lines due to thorium in the HORuS calibration lamp (left). The right-hand panel shows the measured FWHM of many lines as a function of wavelength. The measurements indicate that the instrument has a resolving power of R=λ/FWHM = 23,400, very close to the design of 25,000. The spectrum is heavily oversampled in both the spatial and the spectral directions. 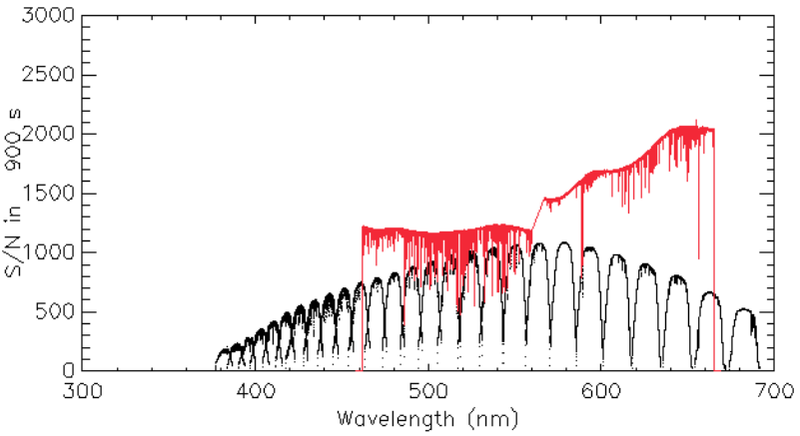 Top: The instrument throughput comparation between the observations obtained with GTC+HORuS (black line) and the output from the exposure time calculator for the UVES spectrograph on the VLT (red line) for the reference metal-poor star HD 140283 (V=7.2, SN~600). Bottom: Same for the Red Giant Branch star HD 122563 (V=6.4, SN~900). Note that UVES is not fiber-fed, and has two optimized arms, but less spectral coverage than HORuS.